Firefox, the award-winning Web browser produced by Mozilla, is a Web browser that is recommended by ITS. This 1-on-1 documentation provides an introduction to using Firefox and describes the features of this browser. The navigation toolbar contains many buttons and boxes that are useful when using the browser. Each of them is included below, along with a brief description. Previous Button – takes you to the last web page that you viewed. On some web pages, this button is disabled. When running a web-based application, use the menus within that application whenever possible and only use the previous button if necessary. Advance Button – takes you to the web page that you view before pressing the previous button. When running a web-based application, use the menus within that application whenever possible and only use the advance button if necessary. Refresh Button – reloads the page. This is particularly helpful if an image or data has changed and you want the current information to display. Stop Button – stops the all data transmission. If a web page is taking too long to load and you want to move on to something else, you can stop the loading of this page and then go elsewhere. Home Button – takes you to your configured home webpage. You can change your default home page by going to Tools > Options > Main. 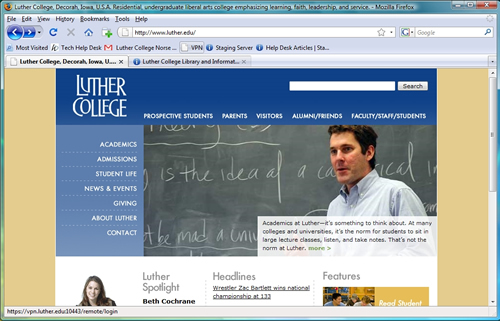 Address Box – this is where you type an address for a web site, such as “http://www.luther.edu”. Use this option if you know the address for the web site that you want. Previous Websites Button – clicking this will show all the previously typed in web sites. You can then select one of the web sites to go back to that site. Go to Button – this button will take you to the web address that you typed in. It is the same as pressing the Enter key when in the address box. Web Engine Quick Search Box – this box is used to quickly search Google or other search engine web sites. You can click on the drop-down arrow to select a different search engine. 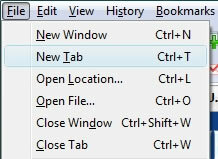 Tab Bar – you can have multiple websites open in a single window, each one has a separate tab so that you can easily switch back and forth between them. Status Bar – this shows how much of your web page is loaded and how much has yet to load. There are multiple ways to open a website in a tab. You would want to open a tab to save you from having multiple windows. There are two basic ways to open a website in a tab, opening a blank tab and opening a tab from a website. 1. 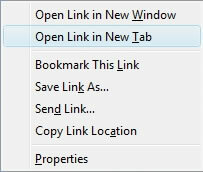 Opening a Blank Tab – There are two ways to do this, the following covers each. Bookmarking websites are a way to make it easy for you to simply click on an Icon to jump to some of your favorite websites or websites that you view on a regular basis. To bookmark a webpage do the fallowing steps. 1. 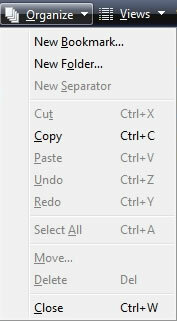 Click Bookmarks > Bookmark This Page… or use the keyboard shortcut Ctrl + D (or CMD + D on Macs). 2. Title the bookmark under the Name field and choose the correct sub folder. New Bookmark – lets you create a new bookmark. New Folder – creates a subfolder in your bookmarks to organize them by a certain category. 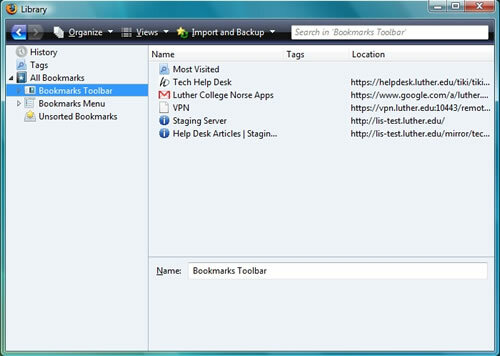 New Separator – this will insert a separator between bookmarks on you bookmarks toolbar. Move – move a selected bookmark up or down your list. Properties – lets you see the URL,Name,and other properties of the bookmark. Rename – lets you rename the bookmark the way you want it to display. Your web browser cache is a stored version of some of the more frequently used websites, cookies and other types of web browser data. It is important to clean this data out for sometimes it causes problems with updated websites and viewing current data that may have been inserted into the webpage. The following step will clear your cache. 2. Select a time range to clear from the drop-down menu. The next time you visit the site you should now be prompted to save your new password or to never save passwords for the site.